Can Wiggle It Jiggleit Crack High Society? “The race is not always to the swift, nor the battle to the strong, but that’s the way to bet.” – Damon Runyon. The sophomore stakes classics are not always to the blue-bloods, but that’s the way to bet. When you look back over the list of 3-year-old colt champions in harness racing, you inevitably encounter horses with carriage trade family trees. Their sires are the uptown swells that reside at the top of the stallion lists and they hail from fashionable female families. But just to keep racing interesting and unpredictable, a horse by a lesser known stallion periodically sneaks into high society and proves that he belongs. This year that intruder is Wiggle It Jiggleit. Can Wiggle It Jiggleit elbow his way to the ultimate signs of respectability, wins in the North America Cup and Meadowlands Pace this summer? Don’t bet against it. In fact it’s not smart to bet against Wiggle It Jiggleit at all since he’s won all seven of his lifetime starts. His pedigree is hardly plebian. His dam earned $140,000 while his second dam Movie Star Laag made $440,000. Skip back two more generations in his female line and you chance upon Stienam, a Breeder Crown winner of more than $1.3 million. Mr. Wiggles was a superb pacer on the track, winning the $500,000 Hoosier Cup as a sophomore. That same year he won elims of both the Adios and Breeders Crown and was second in each in the final. In the North America Cup, he finished fourth. That put his bankroll as just under a cool million in 23 tries as a 3-year-old. Indiana breeders echoed Shania Twain by singing “That Don’t Impress Me Much” when Mr. Wiggles went to stud in the Hoosier State in 2011. He bred only 17 mares and went east to Ohio after one season. In Ohio he bred 20 mares in 2012. 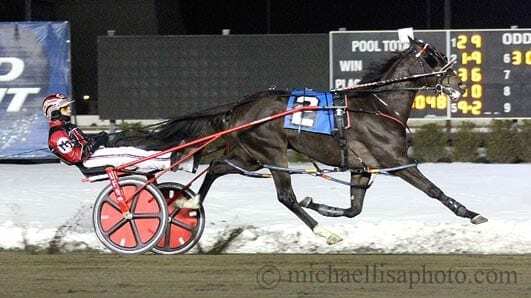 Certainly no one would place Mr. Wiggles among a list of stallions such as Somebeachsomewhere, Bettor’s Delight, Well Said, Art Major, and Rocknroll Hanover. But don’t tell Mr. Wiggles that. There certainly is precedent for upstarts by lesser known stallions winning major races in the sport’s sophomore classics. In fact, that’s exactly how the Hambletonian was ushered in at the Meadowlands in 1981. Shiaway St. Pat, a humbly-bred gelding from the Michigan fair circuit, upset a field comprised of sons of Speedy Crown, Super Bowl, Nevele Pride, and other leading sires of that era. The best sophomore trotting colt of 2002 was Kadabra, by Primrose Lane out of a mare by a stallion named Trotting Happy. Those two stallions will surely never be confused with Super Bowl and Speedy Crown. Kadabra was one of only five colts sired by Primrose Lane in 1999 and yet he showed remarkable talents as a 2-year-old for trainer-driver-owner Homer Hochstetler. He was sold for a long price in early 2002 and went to trainer Jimmy Takter. He earned more than $1.2 million as a 3-year-old despite not being eligible to the Hambletonian. We can dial back three decades to the mid-1980s when a chestnut sensation named On The Road Again came to dominate his pacing peers at ages three and four. His sire was Happy Motoring who got the champ in first crop and never attained that level as a sire again. On The Road Again was a real racehorse who asked no quarter and gave none. In his 61 starts he compiled a 44-9-5 slate and raced all over North America on all size tracks against all comers. He was widely admired by horsemen and fans as he repeatedly defeated pacers by Albatross, Most Happy Fella, Niaitross, and the like. So fancy pedigree helps a horse. A fancy pedigree helps its sale price as a yearling and often assures the horse of a place in a prominent stable. But Americans love overachievers, the ones whose raw talent and desire can lift them from the ranks of the ordinary to the exalted status of extraordinary. Wiggle It Jiggleit is well on his way to making that journey now, but each step up the ladder gets more challenging.